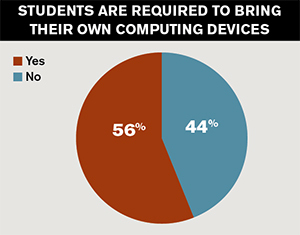 According to our Teaching with Technology survey, 55 percent of faculty support the idea of their institutions providing computing devices to all students, while 67 percent like the "bring your own device" approach. 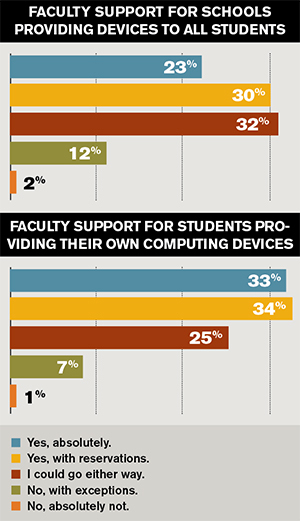 About a quarter of faculty (23 percent) fully support the idea of their institutions providing computing devices to all students. And another 30 percent are in favor of device handouts, but with reservations. These insights and more were part of Campus Technology's first-ever Teaching with Tech survey, which polled faculty members across the country about their use of technology for teaching and learning, their wish lists and gripes, their view of what the future holds and more. Relatively few schools provide devices to students, and when they do, it frequently takes the form of subsidies that students can use to acquire devices from a fixed list of choices at the college bookstore. Nevertheless, a majority of instructors are inclined to like the idea to some extent. When the share of teachers who favor handing out devices is added to the share of teachers who favor the idea but with some reservations as well as those who could go either way, the overall count is 85 percent. People are more inclined to favor the idea of students providing their own devices for classroom learning — also known as the "bring your own device" model, or BYOD. A solid third (33 percent) said they would go with that approach "absolutely." Another third (34 percent) would choose that approach with some reservations. And a quarter could go either way. 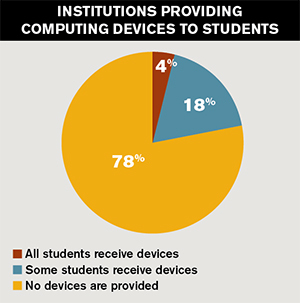 A minority of institutions provides computing devices to students, and in most cases it's only to some students. Typically, it's left up to the student to decide whether or not to provide his or her own computing device. Nearly six in 10 colleges and universities (56 percent) have no requirement that students come to class with computers. Because computing devices need internet connectivity to be useful to most students, we also asked faculty about their perceptions regarding student internet access. Our respondents estimate on average that about 82 percent of their students can get online at home. Almost seven in 10 faculty (69 percent) believe that between 51 and 100 percent of their students have internet connectivity. Also, few institutions provide a means for students to get internet access at home if they're unable to afford it. The presumption in post-secondary education is probably that students can use campus resources when they need to get online to do school work. That isn't necessarily sufficient for one business professor at a New York for-profit college, who suggested that "school supplies" start including the addition of "some sort of internet access package for all students," so that lack of access outside of college "goes away as an issue."